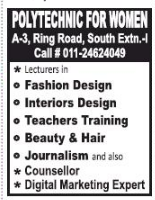 Polytechnic for Women, New Delhi has advertised in THE HINDUSTAN TIMES newspaper for recruitment of Lecturers jobs vacancies. Interested and eligible job aspirants are requested to apply as soon as possible from 24th July 2018. Check out further more details below. About College: The Educational Society of Professionals & Vocationals was formed by like minded educationists, philanthropists & spirited persons, dedicated to bringing about socio-economic transformation. It is registered under the Societies Registration Act of 1860. Polytechnic for Women commenced its professional programmes in 1979, A-3, Ring Road, South Extension-I, New Delhi-49. During the span of more than three decades, the institute has grown to become one of the premier vocational institutes in the country today. The Polytechnic is equipped with the latest types of equipment, machinery, gadgets & innovations. Education is imparted to compact groups of students. How to Apply: Interested and eligible candidates are requested to send application along with CV, copies of certificates, testimonials and recent Passport Size photograph to the postal address mentioned below.